For two weeks I volunteered at Hospitalito Atitlán, a nonprofit hospital located in Santiago, a town in Guatemala with the majority of people of Mayan indigenous heritage. I rounded with the other doctors on the hospitalized inpatients and saw patients in the clinic. On some days, I evaluated patients in the emergency room. I presented on a medical topic in the morning to share what I have been learning in my residency training. I participated in a few outreach clinics in neighboring towns providing free care to pregnant women and other adults and children. I practiced relying more on clinical judgment and less on lab results that we could not get on time. I learned about how patients make medical decisions based on cost, such as the unwillingness to travel to the bigger cities for a higher level of care because of the cost of the ambulance. Another perspective I gained from this experience was on the diversity of the population, with Spanish actually not being the primary language. This experience reiterated the significance of having a doctor who speaks the language of the community. There are few doctors from indigenous communities despite having a large indigenous population throughout Guatemala. 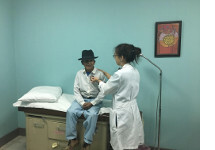 At Hospitalito, patients see doctors who can speak the local language. The patients show more trust in the medical care because of this. I am very grateful for the opportunity to learn more of the history of the country where some of my patients grew up.